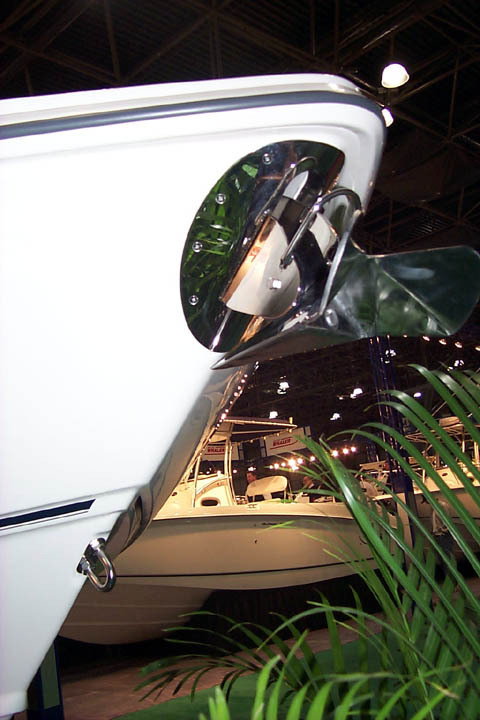 Couldn't make it to the New York Boatshow this week? Forum participant Brian Nunes-Vais was there and found Boston Whaler introducing their newest 32-foot center console boat, the 320 OUTRAGE. He was kind enough to take some excellent pictures and submit them for all to see. Here is what you get for $150,000 these days. 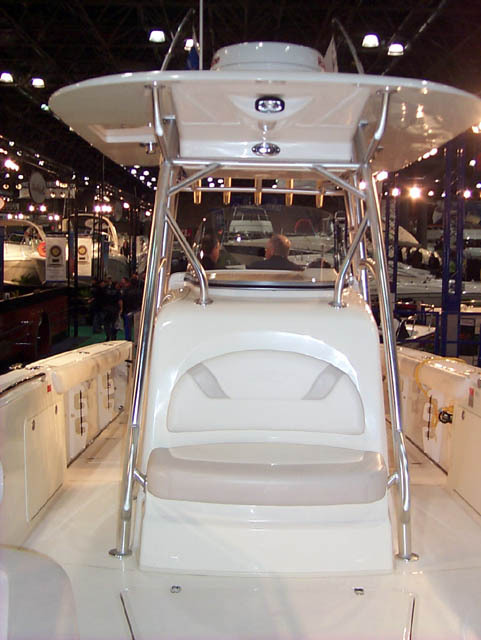 Beginning at the stem, this new Boston Whaler 320 Outrage shows amazing attention to detail and wonderful lines. Note all the surfaces, curves, shapes, etc., molded into the hull at this point. That 6-axis CAD/CAM mill at Sea Ray has been put to good use. The stainless steel anchor roller davit holds the optional stainless steel plow-style anchor. This boat does not have the dark blue tinted gel coat on the hull topsides that was shown in the promotional graphics. 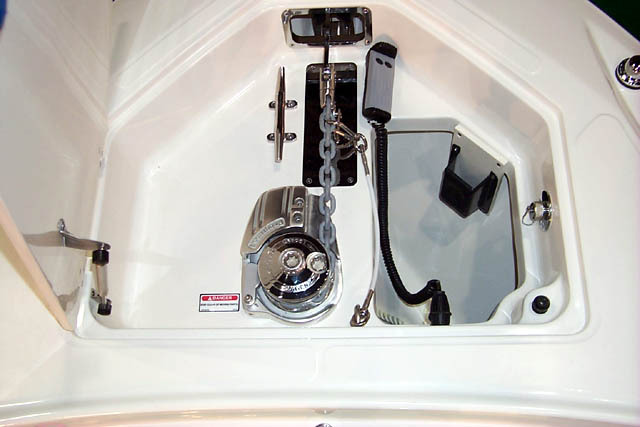 The anchor locker contains a Lofrans Progress 1 anchor windlass, controlled by the remote on the end of the curly-cord. The remote stores in the black holster. Fresh water is available for rinsing down the anchor and the compartment. A small seat for two is provided on the front of the ceter console. Forward on port and starboard there are locking rod storage compartments. In the foreground you can see one of two bow in-deck storage compartments; one is described as a cooler. Behind the center console are more in-deck fish boxes. Design of the T-Top and the welded supports were not a undertaken with a eye to simple fabrication. That is one fine collection of bent and welded tubing. I don't think there is a single piece that doesn't have a slight bend to it. Steps provide access to the roof of the T-Top. The top also provides life jacket storage, an electronics box, and cockpit lighting. Access to the roof of the T-Top is via this hatch. 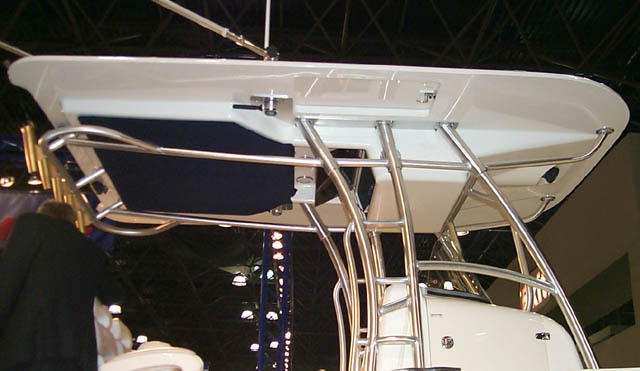 The optional outriggers are rotated by that handle on the left. At this size range, the interior of the center console becomes a small cabin. The VacuFlush head discharges into a 6.5 gallon holding tank with both overboard outlet and pump-out fittings. There is also a pull-out sink and a shower. Storage drawers and cabinets are included. A Clarion AM/FM radio with CD player and 4 speakers is standard. A butane stove is optional. In this view the cockpit floor definitely looks high enough to be self-bailing. Under the deck are twin 150-gallon fuel tanks. In the foreground is a one of the in-deck storage compartments. The wide gunwales have 28-inches of interior freeboard and are covered with coaming bolsters. 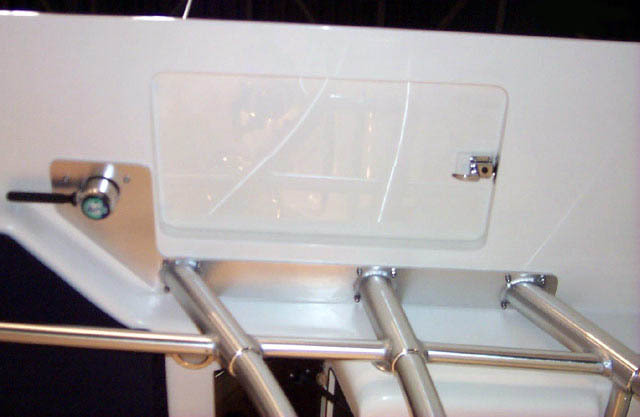 There is just a glimpse of the eliptical armrest on the helm seat. The ladder of the T-Top is clearly seen. The amidship cleat leans oddly outboard. 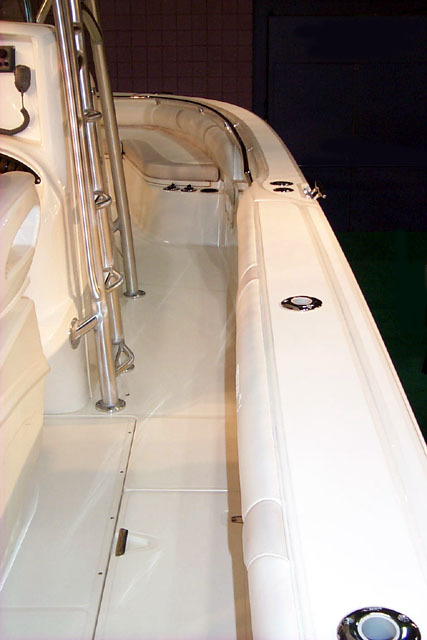 In the bow, cushions cover three more storage compartments. The standard bow railing is the low-profile model seen here. A taller bow railing is optional. In motion picture production jargon, this view is what we call "the money shot" (the scene or take that gives the audience the biggest impact). This will get people reaching for their cheque books. That racy three-spoke wheel with "cheater knob" is pretty much de rigueur these days. The engine controls are Mercury's Platinum control cables. 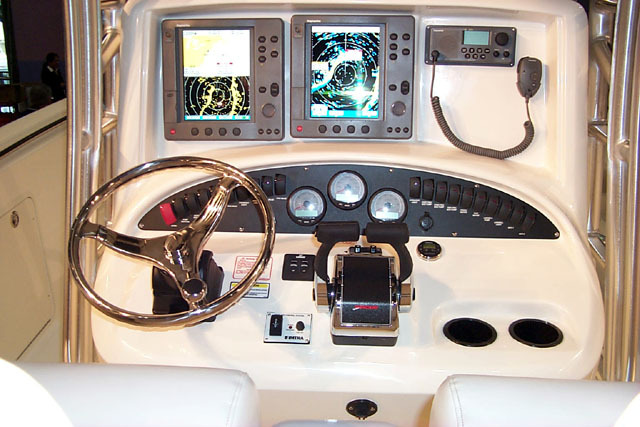 The gauges are Mercury's new Smartcraft deluxe package. Base engines are a pair of Mercury 225-HP Optimax CXXL, with options for 250-HP EFI or 250-HP XS series Optimax. 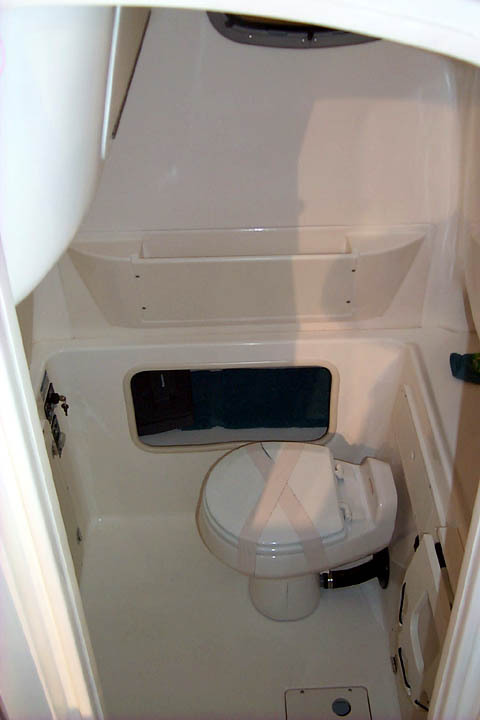 Electric trim tabs are standard. Unfortunately, Brian's photographic tour ends here, the victim of a dead battery in his digital camera! Also, don't make judgements about hull colors from these images as they have been taken in an environment of very mixed light, giving rise to a range of colorimetry that is hard to correct. If anyone else is attending the NYC show, feel free to send along any images you might grab of the 320 OUTRAGE. For more information and specifications on this new model, see the Boston Whaler website. The page has been accessed 34688 times. This article first appeared January 5, 2003.